The latest edition in the Triple Gun Virtual Playbook series is our newest collection of plays from the Triple Gun Offense - plays that Coach DeMeo refers to as "Gadgets and Gizmos". Unlike the first six volumes in the Virtual Playbook series, the plays in Volume VII are what Coach DeMeo refers to as "answer plays". Unlike core plays in an offense - which should be good vs any defense and run numerous times during the course of a game, an answer play exploits a specific defensive tactic. 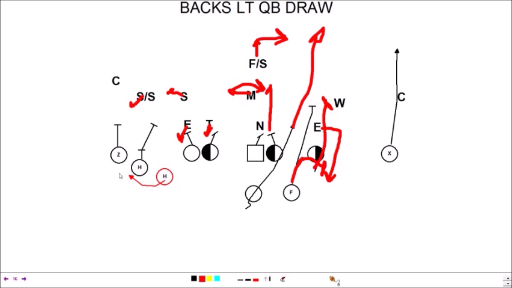 Play diagrams and game video for a total of 15 plays are accompanied by narration and telestration, as Coach DeMeo takes you through plays that exploit defensive adjustments to motion, defenses trying to get an extra defender on the perimeter, defenses trying to blitz the Triple Gun, defenses trying to confuse the Quarterback's read, and more. Also included is a detailed presentation of The Triple Screen (which Coach DeMeo belives is "clearly the single best screen in football") and the Triple Gun Half Reverse - a series in itself. The plays on this edition of the Triple Gun Virtual Playbook can be used with any offense. The Triple Gun Virtual Playbook series also includes The Triple Gun Overview, The Triple Gun Double Options, The Triple Gun Quick Game , The Triple Gun Jet Sweep series, The Triple Gun Play Action Pass Game and The Gun Triple. Like all Triple Gun Voiumes, "Gadgets and Gizmos" is available on DVD and in a streaming edition. 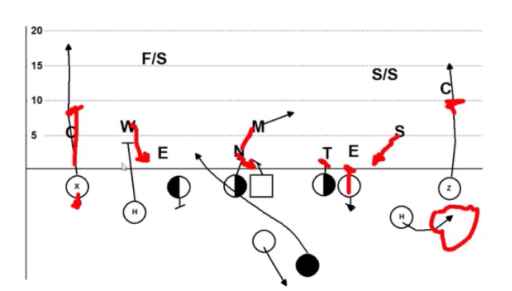 In this Play of the Day Chalk, we take a look at a variation of the Triple Screen that uses a Tight End in the formation to create a Pro look to the field. As the play unfolds, the linebacker stays inside and the Defensive End gets upfield to the TE side. 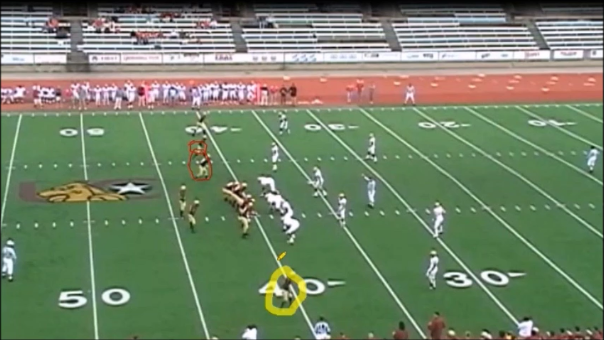 This gives the QB an easy read and he gets the ball to the Tailback for a big play. Available now in our Members Video library, this video is included on the soon-to-be released Triple Gun Virtual Playbook Volume VII : Complementary Plays. 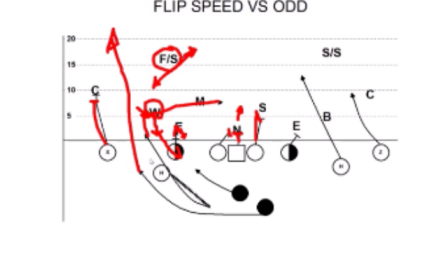 Play of the Day Chalk Talk Volume 71 presents the Flip Speed Option that uses Counter Motion to get the ball to the Tailback and puts "speed in space" quickly. With the ball on the Hash, the Defense adjusts to Twins to the Field by moving to an ODD front with the backers kicked to the field - leaving the Safety to make the play on the Tailback. Watch and Listen as the play unfolds - with the Safety reacting first to the motion, taking himself out of the play and resulting in a big gain for the Offense. Available now in our Members Video library. In our Play of the Day Chalk Talk Volume 70, the play is an RPO from the Triple Gun Offense in which the Quarterback has the option to hand off to the Tailback on a Draw or throw a Bubble Screen. Watch and listen as Coach DeMeo explains why he chose this as a "safe play" to protect a lead going into the locker room at half time. Available now in our Members Video library, this is the 11th Chalk Talk in our latest series - Triple Gun Complimentary plays. Inspired by the Wake Forest "orbit" series, Play of the Day Chalk Talk Volume 69 is an Inside Zone off of a Fake Half Reverse. The play is illustrated with 2 types of motion, creating two completely different looks for the same play. Available now in our Video Resource Library. In the Play of the Day Chalk Talk Volume 68, we take a look at the Crack Screen. 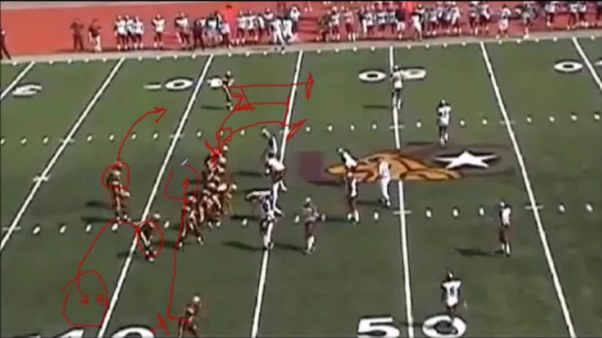 Another play that "puts speed in space", this screen variation, run to the single receiver side of a 3x1 formation, also gives the QB an option to throw the Bubble based on the Defense's alignment. Available now in our Video Resource Library. 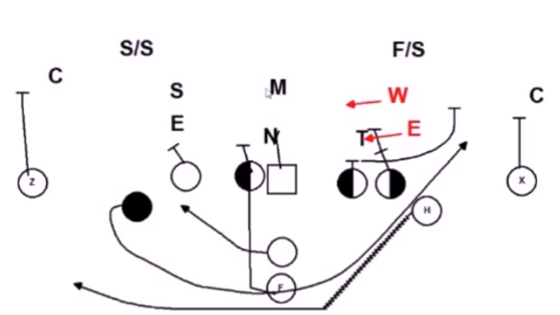 In Volume 67 of our Play of the Day Chalk Talk, the play is the "Stud" Option. 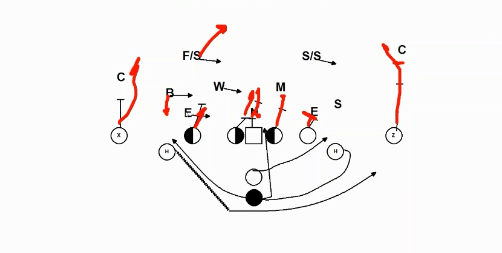 In this, the Triple Gun variation of what is often called a "load option", the handoff key is blocked and the play is run intentionally into the boundary to take advantage of the alignment of the Free Safety in a 3 shell. 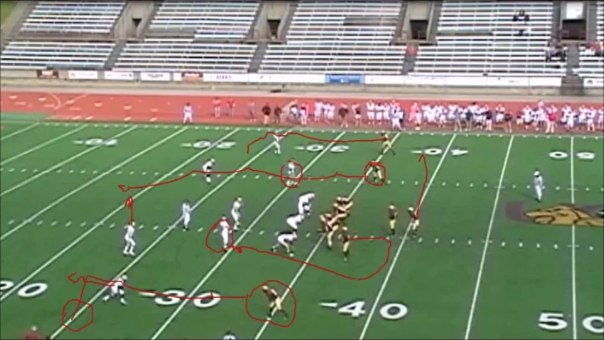 In the Play of the Day Chalk Talk Volume 66, Coach DeMeo presents one of his favorite Red Zone plays, the QB Draw. Shown against the 4-4 Defense of a perennial powerhouse opponent, the play is run from a 3x1 Spread Offense look - making it an easy addition to a wide range of offenses. The play illustration portion of this Play of the Day Chalk Talk showcases the presentation capabilities of the Slide Show module from Coach's Office productivity software. In the Play of the Day Chalk Talk Volume 65, the Zone Read from a Trips formation is shown against a 4-3 front. Coach DeMeo points out a number of benefits of using this play as a complement to the Gun Triple, including: 1) The Handoff Key gets a different look and has to change the way the handoff is played, 2) the Offense can pick different players to run the ball, and 3) it becomes difficult for the Defense to take the Tailback out of the game. 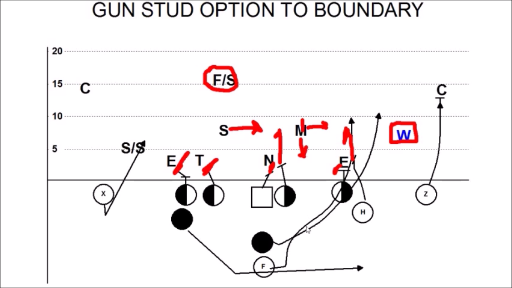 In an added bonus in this Chalk Talk, a complementary RPO is illustrated and explained, which can be used in addition to the built in "flash" that is part of every run in the Triple Gun Offense. Available now in our Members Section. Option Central News is available to both Members and Guests. In each issue, we feature one or more articles, videos and other resources on Option Football as limited-time "previews". Our latest issue also includes a book "giveaway". Not receiving Option Central News yet? Sign up now ! In the Play of the Day Chalk Talk Volume 64, Coach DeMeo illustrates and explains the Stretch Pass with Whirley Motion - a pass play that gives the illusion of the Gun Triple Option. By using a formation that forces the outside backer to widen his alignment, a 6 man protection is made possible - and the backside slot gets a free release into his route. An added bonus in this Chalk Talk is a detailed explanation and illustration of how to adjust the pass protection if a seven man rush is possible by the OLB's alignment. Available now in our Members Section. The Quarterback Iso is the Triple Gun Offense's variation of the "QB Follow" play. In addition to giving the QB a better cutback option, the Triple Gun QB Iso gives him a chance to better read the Tailback's block. 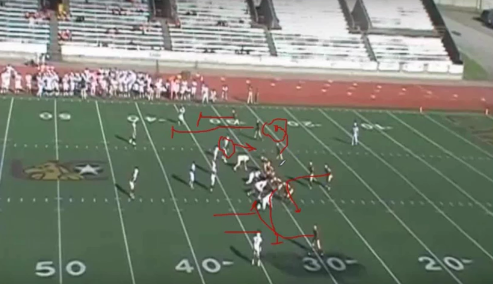 In the Play of the Day Chalk Talk Volume 63, Coach DeMeo illustrates and explains the play against the 4-4 Defense of a perennial powerhouse in Division II. The Flip Screen is a Triple Screen that works as a counter to the "regular" Triple Screen. 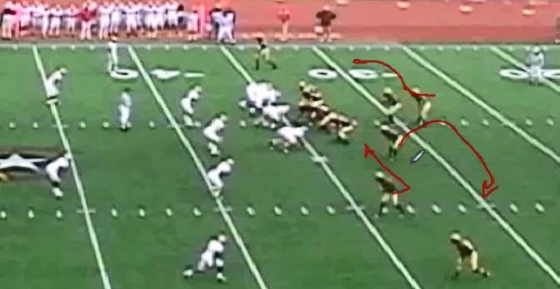 In our Play of the Day Chalk Talk Volume 61B, Coach DeMeo illustrates and explains the play that uses Flip motion to create easier blocks and makes the slot to the side of the screen the primary receiver. 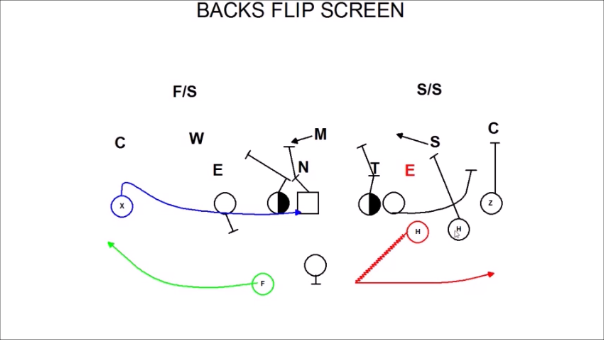 The Flip screen, like other videos in this Play of the Day Chalk Talk series illustrates a play that complements the Gun Triple core Runs and Passes. Available now in our Members Resource section. Steve Gunther, long time football coach and now Author/Publisher of a number of option books and videos returns with an article based on the concepts in his latest book, "How to Coach the Option Running Game". 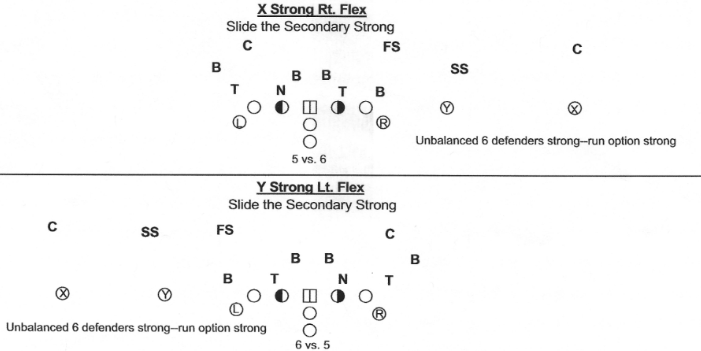 In his article entitled "Flexbone Unbalanced Formations vs. 8 Man Fronts" Gunther includes illustrations and examples from Paul Johnson and Emory Bellard and adds ideas of his own based on a 43 year coaching career. Gunther's previous articles include the Flexbone Triple (click to view) and A Defensive Front Identification System for Option Football. The latter is an excerpt from the book, How to Coach the Wishbone Football Offense, According to Emory Bellard. Gunther was an assistant for Bellard at Spring-Westfield High School, Houston, Texas from 1990-1994 - Coach Bellard's last 4 years of coaching. Bellard is best known as the founder of the Wishbone, an offense he developed while on the Staff of Darry Royal at the University of Texas. The Half Reverse from the Shotgun is an efficient, single reverse that avoids the "feast or famine" scenario for most reverses, since it can be run without worry about a loss of yardage. Listen to Tony DeMeo Chalk and Talk his way through another play that complements the option by taking advantage of the Secondary rolling and the Defense reacting to the Option action. Available now in our Members Resource section. Coach Tony DeMeo is back at the digital chalkboard for Play of the Day Chalk Talk Volume 61. In this, the first in a new series that focuses on Triple Gun Complementary Plays, we take a look at game footage and a play illustration for the Triple Screen play. Other videos in the Play of the Day Chalk Talk series will illustrate a variety of plays that complement the Gun Triple core Runs and Passes. As with many plays in our Chalk Talk series, the Triple Screen can be run from virtually any offensive formation and fits into any offensive scheme. Available now in our Members Resource section. With Super Bowl LII just a few days away, we fired up the Digital Chalkboard for a special edition of our Play of the Day Chalk Talk series. 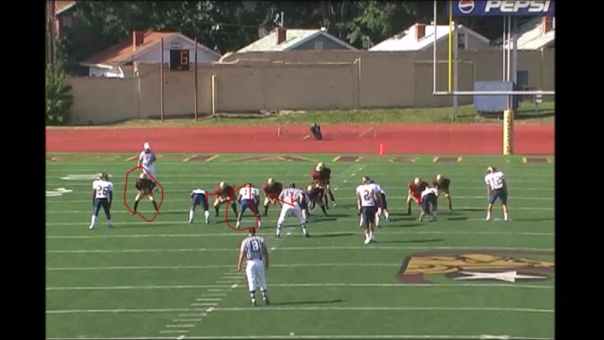 In Volume 60, Coach DeMeo takes a look at the Eagles RPO play from the Defense's perspective against 2x2 and 3x1 formations.